Does it make sense to have Twitter as the “Social-Network-of-Choice” on Apple’s iOS 5? It’s no secret that Facebook has been trying to work out a deal with Apple to be integrated into its new operating system, but at this year’s WWDC, Apple announced that Twitter will be the social media service that will be fully integrated into their iOS 5 operating system launching in fall 2011. 1. Twitter is already the leader in mobile use per user: 50% of all Twitter users access the social network from a mobile device (source) – Facebook sits at less than 40% in this category. Also, only about 30% of Facebook users send updates from mobile devices, whereas 40% of ALL tweets are sent via mobile device (source). This new partnership with Apple will definitely help Twitter broaden its lead as THE mobile social network. 2. Twitter is better for sharing. How dare I say that? Here’s how I see it: Twitter is for sharing with the world, facebook is for sharing with people you know. Most of us have our Facebook privacy settings cranked up so high that people need to be friends with us to see our content. Contrast this with Twitter, where most people don’t protect their tweets, meaning that the opportunity for your message to be read, and re-shared, around the world is much greater. Twitter’s strength is that it is an open community that lets ideas flow in and out, without needing to be “approved” to join the conversation. Even though Facebook has 629M users, only a couple hundred will ever see what I post. 3. 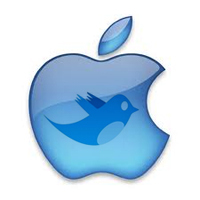 Twitter fills Apple’s need for a social media partner. This decision may have been a result of wanting to buddy-up with a social media giant, just like Microsoft and Facebook have done for years. With millions of dollars invested in Facebook by Microsoft since 2006, Apple is a bit late to the game, but they’re looking to turn the tables on this front. Twitter is the best option out there as it has proven to be a worthy rival of Facebook, but this integration with iOS 5 signals a new battle over who will be the internet’s primary third-party Identity Provider. I look forward to seeing how this plays out at the end of 2011. What do you think? Big win for Twitter? Big loss for Facebook? Will Facebook team up with Google for integration on Android phones? Let me know what you think. Big thanks for @PhilGaudreau for suggesting this blog topic for www.davidhallsocialmedia.com.